These blades have been developed for the scale pilots. The dull black surface supports the scale look. Our logo, the three bars, was placed at the inside of the blade nearly invisible but noble, to support the scale look. 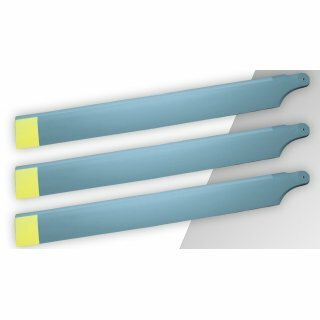 These blades do have an asymmetrical airfoil and produce lift an angle of attack of 0 degree, enabling the pilot to decrease the flight rpm considerably, without losing any climb performances. The additional weight of the fuselage, lighting system and other mounting parts can be easily compensated for. These blades are available as two blades systems and in addition to as multiblades system with much smaller blade depth. The very low fl ow line combined with the more to the tip of the blade positioned center of gravity prove a very stable straight and level fl ight and optimized performance. These attributes are supporting the requirements of modern FBL Systems, for which these blades are optimized.